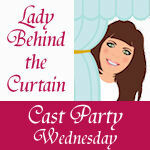 Today, you get so see the crafty side of the blog today instead of the cook side. I have a no sew fleece blanket that I made as a teenager. We keep it draped over the sofa for easy access. My little boy loves that blanket. He wasn't feeling to good one day and was cuddling with it so we wrapped him up and put him to bed with my blanket. I decided I should make him his own blanket, so we can keep the old blanket on the sofa and not in little boy's bed. When I made that blanket years ago I learned to make it by cutting the fringe and tying the two sides together with knots. When I had a baby shower for little boy a couple years back someone gave me a fleece blanket and it was put together a little differently. It didn't use knots. I really liked that idea especially since I know some people think the knots can be too bulky. I'm going to show you how to make the blanket without knots. We also had a little travel size pillow that little boy was using. I did not have a pillow cover. 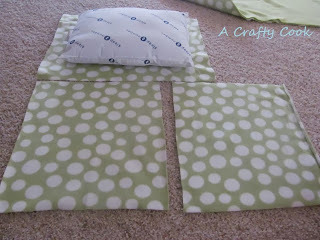 I decided I could probably make a no sew pillow case to match the blanket. First, you are going to need fleece. I used 2 yards of a solid colored fleece and 2 1/2 yards of a printed fleece. That extra 1/2 yard of the print will be used for the pillow cover so you can go ahead and cut it off leaving you with a 2 yard length of print for the blanket. Keep in mind my pillow is not a standard size pillow, it was only travel sized so you may need more than 1/2 yard of fleece depending on the size of your pillow. 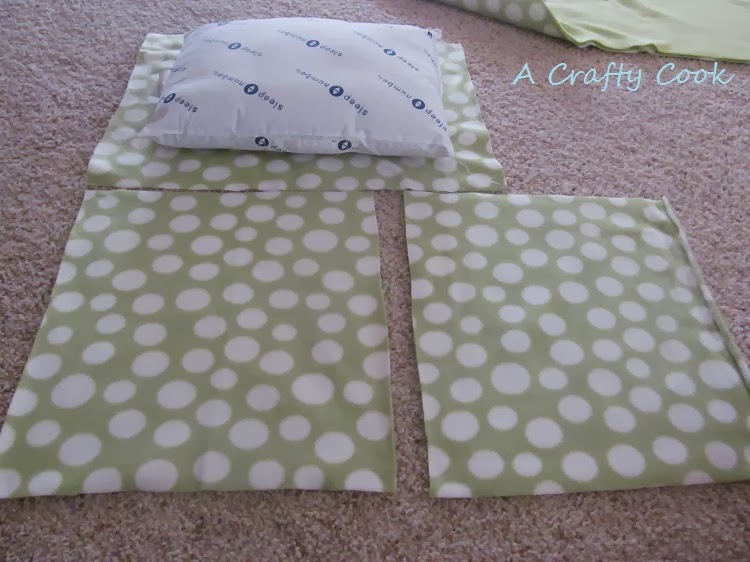 To make your pillow , place your pillow on the 1/2 yard print and cut a piece that is about 5 inches bigger than your pillow all the way around. Now you need to cut two pieces that are the same height as the last piece you cut but are only about 2/3 the width of that last piece. Take those two smaller pieces, right side facing down toward the floor, and overlap them so that together they are the same size as the first piece. Take the first piece and lay it on top of the other two pieces, right side facing up toward the ceiling. 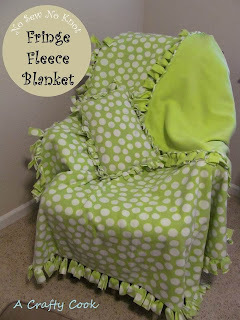 Now you can cut the fringe around the pillow case pieces. Make sure you cut through all of the layers. Cut the corners off and make the fringe the about 5 inches long. (If you want to do knots this is when you would tie them. Take the back and front fringe and tie them together. I would use a square knot) But we aren't doing knots here and because we aren't tying knots we need to cut holes in our fleece. 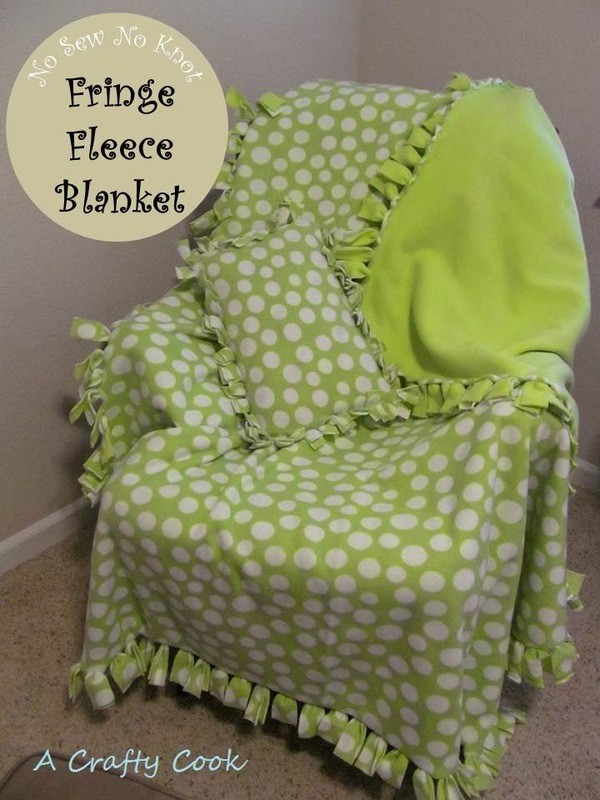 We want a hole at the end of each fringe where it meets the main body of the blanket. The holes need to go through all of the layers. I found that the holes worked best if they went across the fringe, horizontally (like in the picture below) instead of the going in the same direction, vertically. Once the holes are cut you will take all layers of the fringe and push it up through the hole. 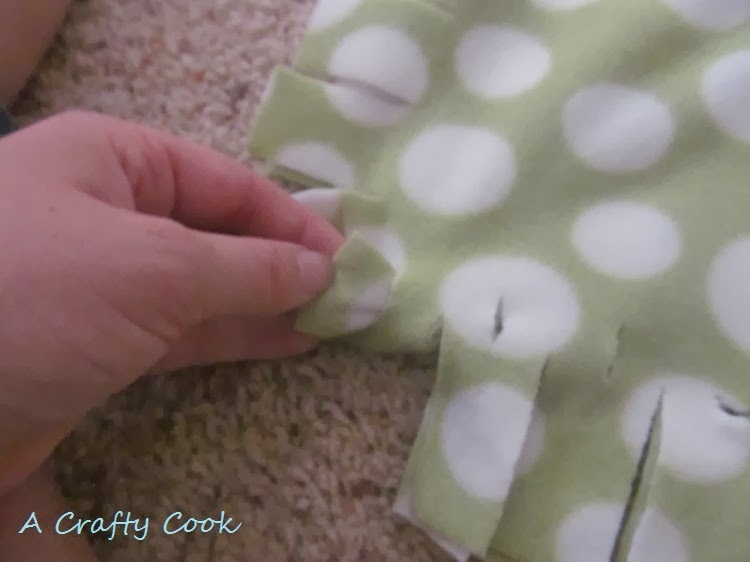 Pull the fringe through to make sure the entire piece of fringe gets pulled through snugly. 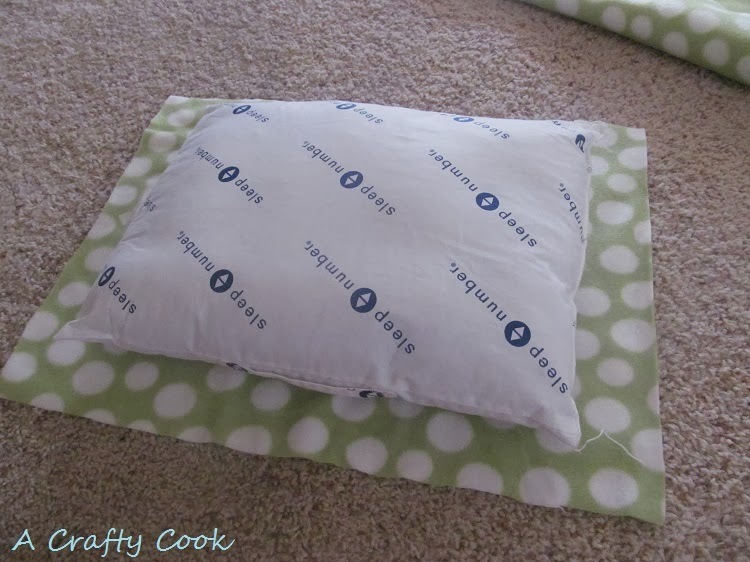 Work all the way around and there you have it, a no sew pillow case. Now remember how the we overlapped the two pieces in the beginning? Because of this we are left with an opening on the back of the pillow case we can use to get our pillow in and out. Go a head and open the case up and shove your pillow in. The blanket will be worked the same way as the pillow. Take the 2 yards of solid right side facing the floor and line up the 2 yards of print on top with the right side facing up toward the ceiling. Cut your fringe, make your holes, and pull the fringe up through the holes. 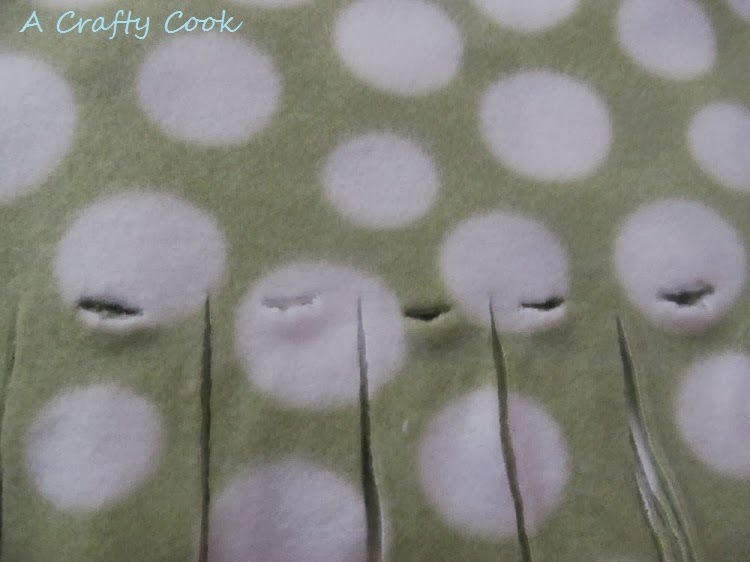 What I like best about this method is that the printed fleece leaves a nice little border around the solid side. When I did the pillow I did entire side at once. 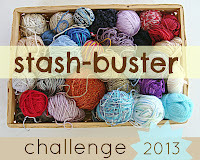 When I was working on the blanket I would do 8 or 9 at time, whatever was within reach. I like this idea better than the hard knots. The knots are not snuggly. 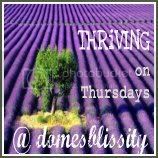 I'm a new follower from the Bloglovin Blog Hop. 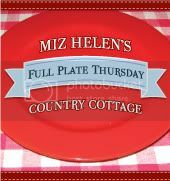 I am a co-host today so thanks for taking part. The fleece stretches. Do you notice any overstretching or the holes getting bigger with this method of pulling through? What did you use to cut the holes at the top like that? 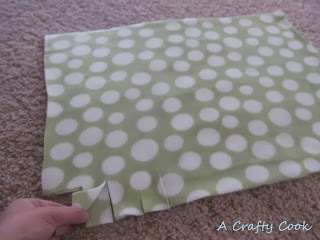 I used the really small rotary cutter with a mat underneath. Just push straight down. Do not roll back and forth as that makes too big a hole. This worked well for me. I love my rotary cutter! 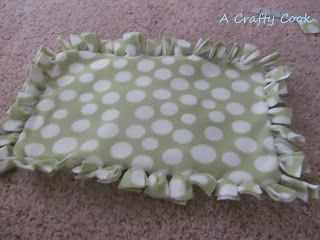 It wild take me 2 days to cut and tie 1 blanket. I now useuse the rotary cutter and mat, takes me 2 hours the most to cut and tie. Sorry for the confusion. To quote the directions above (found between the 6th and 7th picture) "I found that the holes worked best if they went across the fringe, horizontally (like in the picture below -7th picture) instead of the going in the same direction, vertically." Honestly though, you could cut the slits either way and you will get the same effect. I just like way the horizontal slits look a little better, because fleece stretches. 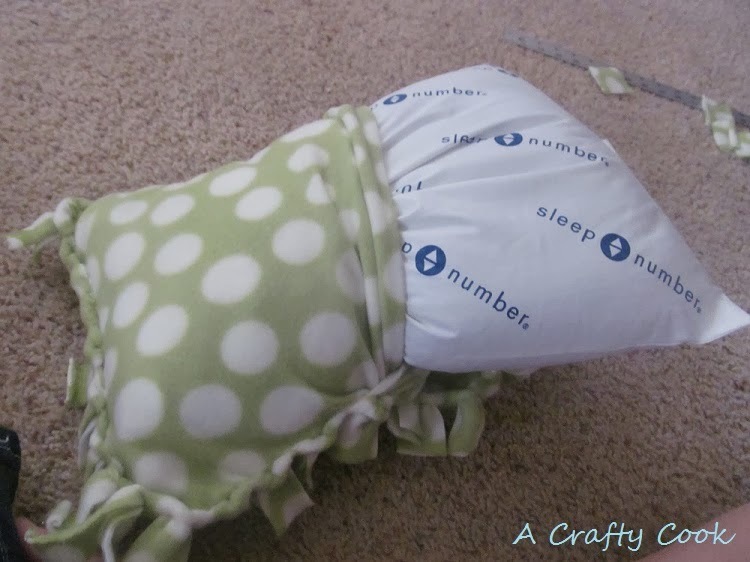 How many yards would you recommend for a decent size blanket? 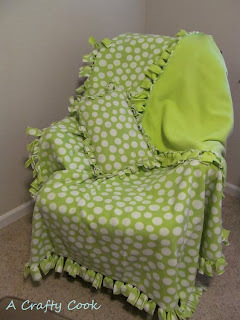 I used 2 yards, but 1 yard makes a nice sized blanket for a baby. I have made several fleece blankets with the knots. My next one will have the slits. Does this only work with fleece? To be honest, I can't really say for sure since I've never tried anything other than fleece. But, if you were to try it with something other than fleece the only advice I could give would be that the fabric would need to be something that wouldn't fray or come undone when it was cut into. 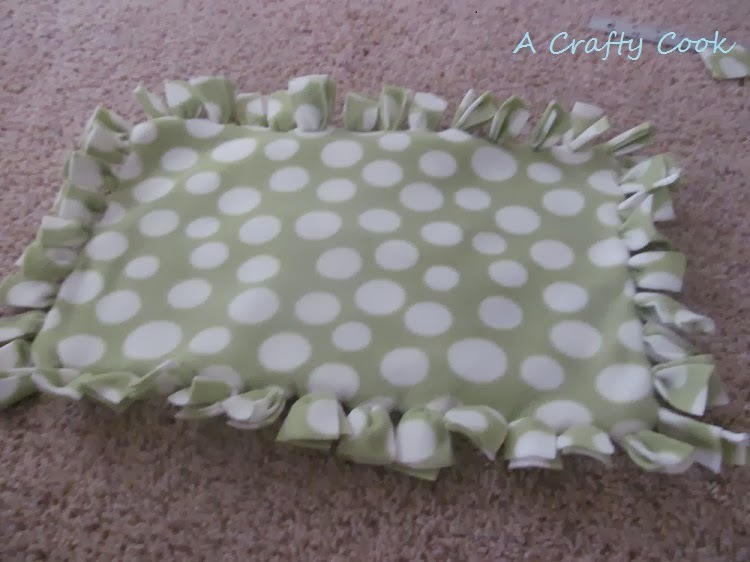 Are you able to wash the blanket and pillow case without the ends slipping out of the slits or stretching the holes more? I haven't had any problems washing them. What a fun idea! 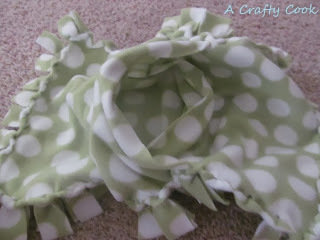 We have tons of the knotted blankets, but I've never tried making them without the knots. Will definitely add this to our repertoire of homemade gift ideas! Does this come apart when washing? 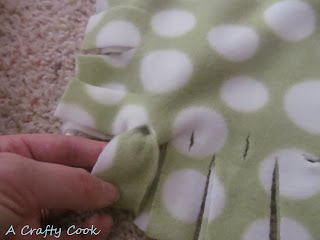 I have not had any problems with it coming undone in the wash.
What did you use to make the slits? 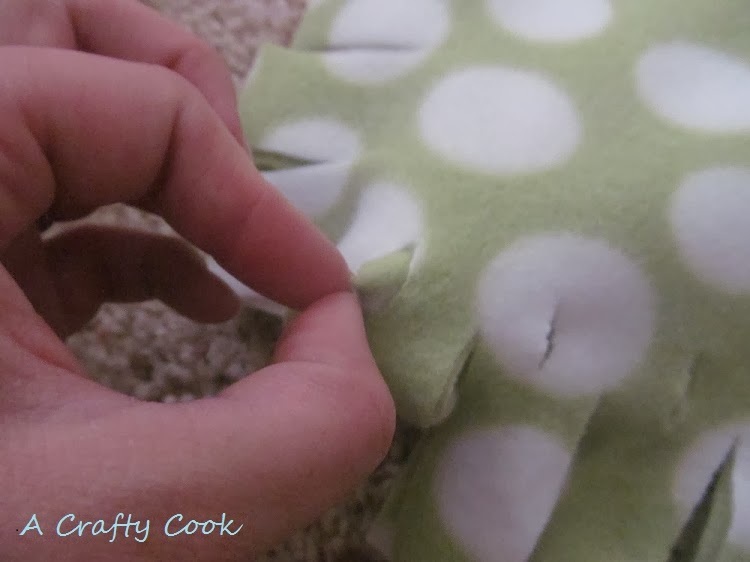 I found it easier to make the hole with a seam ripper rather than scissors. Also, I used a large crochet hook to bring the strips through the hole. 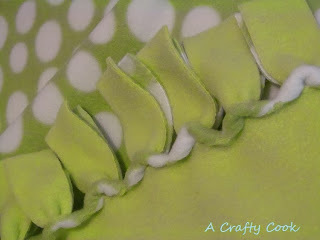 Did you cut a 2", 3" or 4" square out of each corner of the blanket before cutting the fringes? Since I cut the fringe to about 5 inches long. I cut a 5 inch square off of the corner. What a great alternative to tying all those knots! And, it looks great, too. 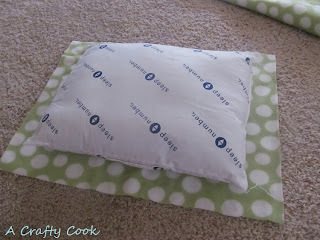 I've been searching for a no sew way to make drop cloth pillows for our sofa and will give this a try with drop cloth in lieu of the fleece. Thanks for sharing! How do you suggest doing a standard size bed pillow? I supposed I would do it the same way, but have no idea on how much more fabric that would require. 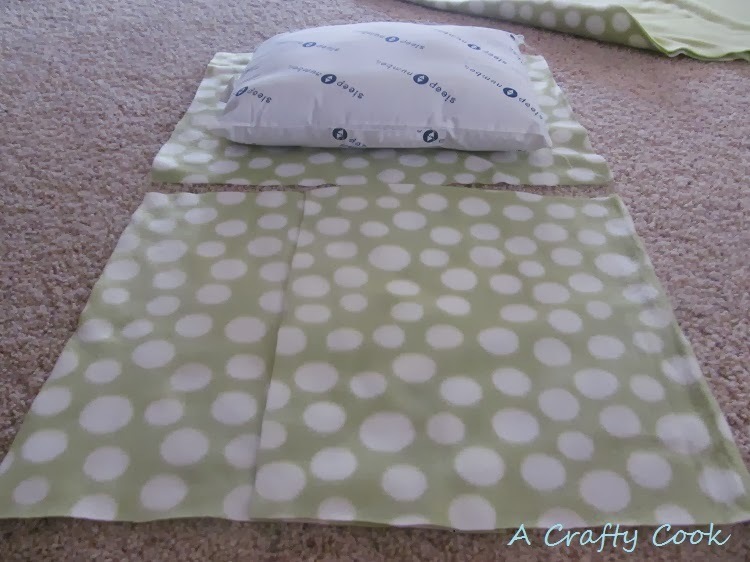 Well, I'd probably do it in two colors like the blanket instead of just one color like the travel pillows. 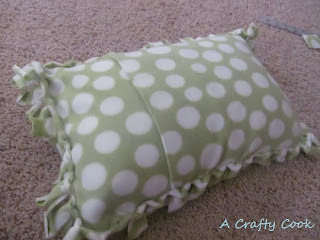 Do you cut out a square on the ends of pillow and blanket, like the knotted one, if so how much? Yes, cut a square out of the corners. If you make your fringe 5 inches long you should cut a 5 x 5 inch square out of the corners. I you make your fringes 4 inches it should be a 4 x 4 inch squares. Basically, it should be the same as the length of your fringe. 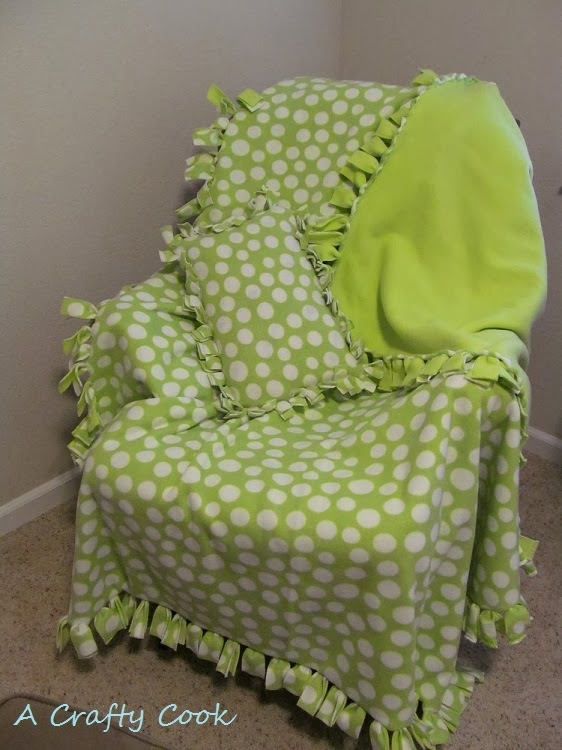 What size blanket is this? I'm not sure it fits any standard bed measurements, but before cutting the fringe it the fleece would measure aproximately 58" x 72". So it would be wider than a twin size comforter but just a few inches shorter than the twin comforter. 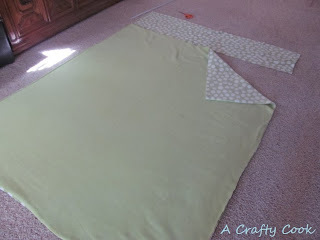 I'm making a no sew fleece blanket for my nephew. Thing is I'm making it like a quilt. The knots are lumpy and make it no the best to lay on. I like this idea, but worry it wouldn't hold the squares together well. Any ideas? Love this idea! Wondered how far apart did you make your 5" cuts all around the quilt? 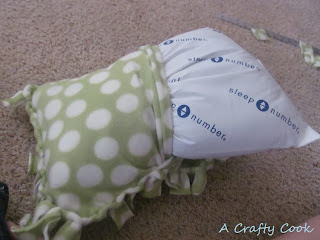 Curious what the measurements are for your travel pillow? My niece wants me to make these for her 4 daughters, but will probably be standards pillow size. So I'm trying to decide how much fleece to buy for each pillow. Knowing the size of the travel pillow would help. Thank you! I bought 2 yards of fabric from The Fabric Exchange, I will try to make one for my baby . Hi! Can I do this method but tie them off instead? Will this length of strips work for tying? * Size: 130X150CM, 140X180CM, 150X200CM and so on. * quantity: 500PCS / solid color, 1000PCS / print design. * sample costs: $50 / PCS / color, $300 / $500 / design according to complex and different print designs.